You never forget your first state-of-the-art home theater experience. The big, sharp picture, the realistic, immersive sound all around you, and the smiles on the faces of those watching with you. 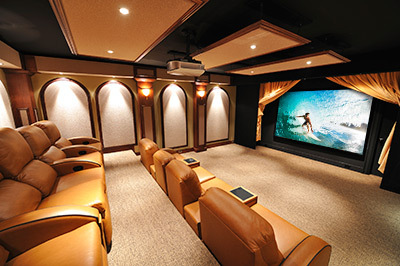 Thanks to today’s great equipment and our 40 years of experience, never before has the concept of a home theater been so real and achievable. We’ve designed a wide variety of theater packages to fit almost every budget and room style. Plan some time with us to explore this exciting addition to your home. We’ll listen carefully to your needs and make sure you are as thrilled as we are.